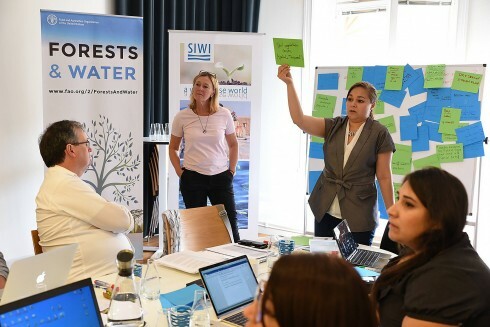 During three highly interactive days, approximately 20 forest and water international experts convened at the SIWI office in Stockholm to discuss how to monitor interactions between forests and water, quality and quantity. By the end of the week, after intense brainstorming and discussion, the workshop succeeded in producing a preliminary list of indicators for how to best observe the impact of changes in forest on water flow, water quality and how this influences policies and socio-economics. The workshop was a response to the repeated call for improved monitoring and reporting of forest-water interactions from key international forest and water stakeholders. It also directly contributes to the Forests and Water Action Plan, launched at the World Forestry Congress in September 2015. The workshop was initiated by the FAO Forest and Water Program and hosted by SIWI Swedish Water House, as part of the FAO objective to formulate an interactive Forest and Water Monitoring Framework and Tool. The scientific community has lead the way in understanding interactions between forests and water, from individual trees and stands to regional and even global scales. Research though, is often biased towards particular geographic and social contexts and is often limited in time scale. There is still a need to better explore and understand the effects of forest management and land use change on water yields and quality, as well as the protective and regulative function of forests for water. An informal, preliminary assessment of forest-related development projects has shown that the monitoring of forest-water interactions has not formally been included in practice. Despite an increased recognition of the importance of forests for water resources, there is a lack of monitoring and therefore an understanding of forest-water relationships on the ground, especially after changes in forest or land management. Moreover, insufficient data means there has been limited influence over the adoption of integrated forest-water policy and practice. With climate and land use changes having an impact on several environmental flows, it is crucial to better understand forest ecosystem services under natural conditions and modified or managed landscapes, and how changes in land management impact forest-water relationships. Moreover, water is a fast-emerging cross-cutting issue in climate change discussions; and forests continue to be recognized as a potential solution for climate change. With the next COP in Morocco focusing on forests, water and agriculture, the monitoring framework is timely. The monitoring framework will provide the initial step for project development, improved practices, informed integrated forest-water policies and increased monitoring and reporting (potentially contributing to future FAO Forest Resource Assessments and other publications). Ultimately, the framework and consequent data will assist countries in their activities to meet SDGs 6 and 15. The workshop started with a crash course in the complexity of forest-water interactions given by Dr David Ellison followed by SIWI highlighting how crucial data availability is for policy work. What is not measured does not exist, and no decision maker will take action on proposals which are not grounded in monitoring, reporting and evaluation. Representatives from Fundecor, WeForest, Kenya Forest Services, Gold Standard and the Universities of Sao Paolo and Mendel then followed, sharing examples of monitoring challenges and opportunities faced in practice and research. Participants also had the opportunity to be inspired by the scholarly and practical work Sweden has accumulated in the topic of forests and water by visiting the Royal Academy of Agriculture and Forestry and to venture on a fieldtrip hosted by Sveaskog in the beautiful Swedish landscape around Öster-Malma, some 60 km south of Stockholm. What are the indicators, variables or methods? During the rest of the three days, indicators, variables and methods for water flow, water quality and socio economic factors were intensively discussed in break out groups, and then scrutinized and revised in plenary sessions. Elaine Springgay, Forestry Officer at FAO, challenged participants to ensure suggestions remained within the forests and water scope, adhered to framework guidelines and were practical in their application. The tricky objective was to identify the relevant indicators which can be measured in projects and by people which do not necessary have access to expensive and intelligent technology, but rather methods that can easily be used by anyone, in any project. Simplicity and relevance were key. The preliminary list of indicators contribute to a skeleton framework, which will be compiled and processed by FAO with further consultation with various forest, land and water experts. A zero draft of the framework is scheduled for the end of the year with the piloting of indicators and methods aimed for 2017. It is currently targeted that a beta version of a forest-water monitoring tool will be available in early 2018, allowing forest-water interactions to be more easily monitored in activities and therefore improving our understanding of forest-water interactions.